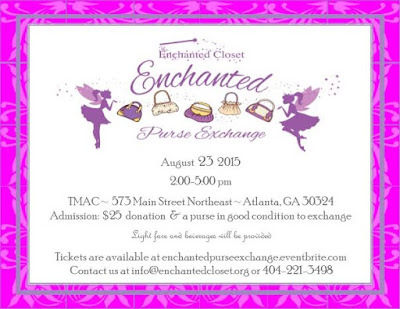 The Enchanted Closet Inc., a volunteer-run nonprofit organization serving teenage girls from low-income households across metropolitan Atlanta, will host the Enchanted Purse Exchange on Saturday, August 23, 2015 from 2:00 to 5:00 p.m. at the TMAC-Lindbergh City Center, 573 Main St NE Atlanta, GA 30324. The purpose of the event is to raise funds to support the operation of the GIRL$ Program, a program defined as a Service-Learning Program designed to increase the self-awareness, self-esteem, and self-sufficiency of middle and high school girls, residing in metropolitan Atlanta. The event cost is a tax-deductible donation of $25. Attendees will have the opportunity to snag a great purse, save money and support the empowerment, and social and professional enhancement of the girls in metropolitan Atlanta. There will be also be an “auction” of enchanted purses donated by various artisans and designers, an opportunity to network, enjoy good food and a chance to win special door prizes. Founded in 2003, with the mission to physically, mentally, and emotionally outfit girls from low-income families through programs that prepare them for social and professional milestones, the Enchanted Closet is a 100% volunteer run nonprofit service organization that benefits the girls of metropolitan Atlanta and other cities as far as Macon and Savannah, Georgia. Realizing that many girls from low income families have obstacles to overcome, the GIRL$ Program was designed to help increase the self-awareness, self-esteem, and self-sufficiency of girls. The Enchanted Closet aims to build their confidence, equip them with education, exposure, support, and opportunities. Girls attend monthly sessions which focus on identified critical needs, economic and social entrepreneurship, and community service. By focusing on these areas, the organization has seen a reduction in high-risk behavior that contributes to low academic performance/school dropout, teen pregnancy, sexual exploitation, abuse, STDs and other things that adversely affect the lives of teens, their families, and the community. An average of 500 girls living in 14 plus metropolitan Atlanta counties are served each year through the Prom Dress Giveaway and GIRL$ Programs. The organization has served nearly 6000 since 2003. Go to www.enchantedcloset.org to view more information about the Enchanted Closet.